1stGen.org • View topic - Tools! We always had craftsman because the Western Auto is 1/2 mile from the house. They sold all craftsman tools and had a great selection. When stuff busted we just got replacements. Well, Western Auto suppliers went under and now they carry cheap crap. Even the local Sears closed 10 or more years back. I can bust ratchets off now before the price sticker wears off the craftsman stuff and it isn't because I am strong. Now we get a big busted tool pile and the old man takes an hour drive to the nearest sears and gets them replaced. I think for cheap tools with warranty its hard to beat Lowes and Home Depot. Those are just a half hour from here. As far as high end stuff I like Snap On. For what I do, those are just to expensive. Well I got tired of having tools spread all over. I decided to drop a little bit on a new box and a bunch of tools this week. I bought a bunch of stuff to add what I already had and need anoth box now. For the price it was hard to pass up. I can get another one of these and only spend about $50 more then what my price would have been on a Snap-on 6 drawer roll cart. I didn't realize how many tools I had spread out all over the place. I've already filled this cabinet up. yeah it fills up fast. 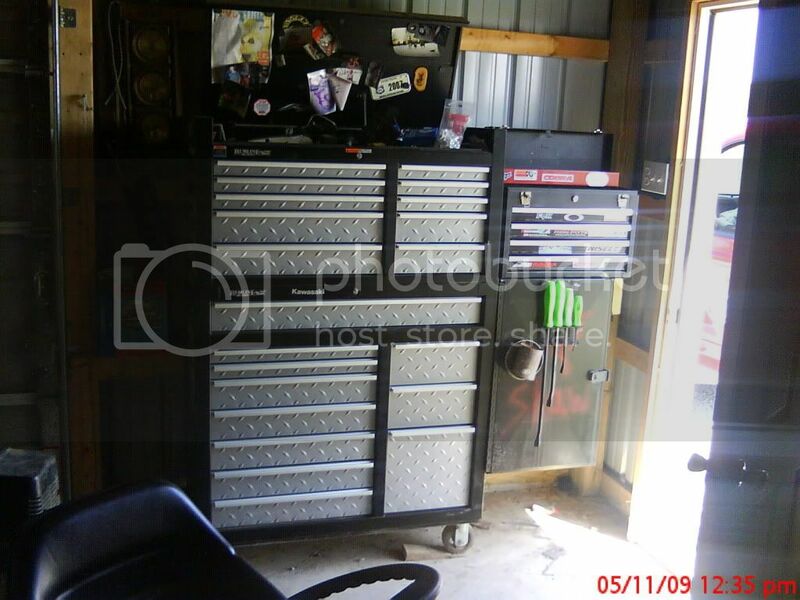 My tool box is Snap-On as is most of the tools in my toolbox. I would have to drive 1.5 hrs to warranty any Craftsman tools as there are no Sears around here anymore. My brother and I work in our farm shop, and the Snap on truck stops by every other Tuesday. Without fail, and has never questioned a warranty item. I either give him money on my account every two weeks, or I'm buying something. How many Sears stores will let you have $500 in tools, and then let you make $20 payments, without having a credit card? 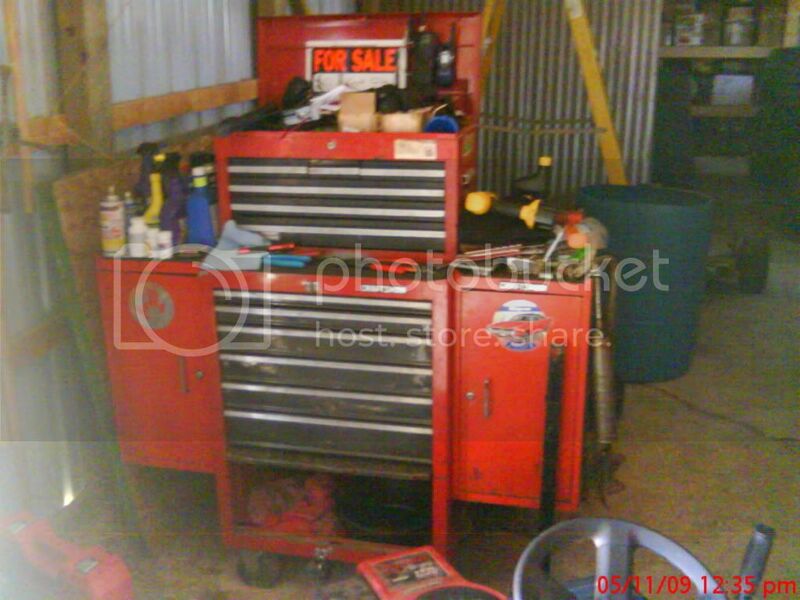 I would never encourage any weekend warrior/wrencher that he/she needs a complete Snap on tool kit. I will recomend buying a Snap on Ratchet to go with your 3/8" sockets from Craftsman. I will only buy from the guy that is easy to get ahold of, that shows up regularly, and has good stuff. I've been lucky with Snap on tool guys. 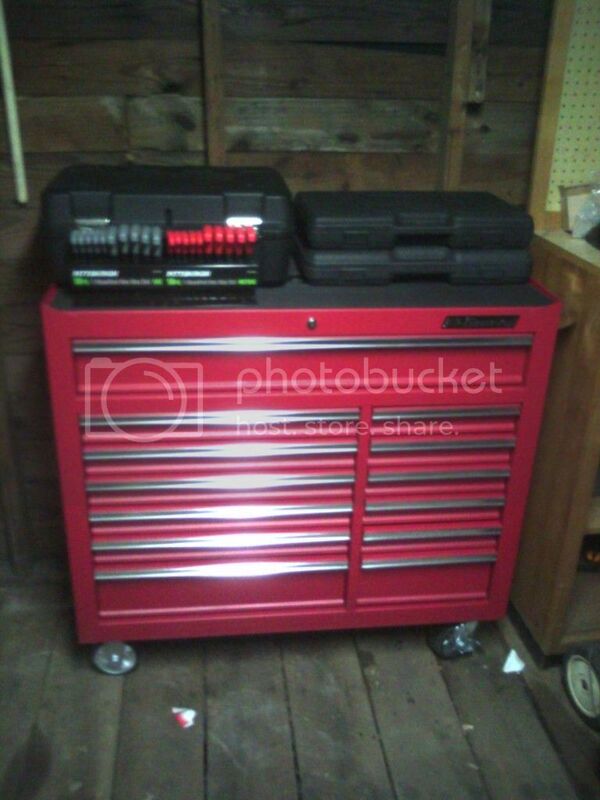 If you need a toolbox, look for slightly used Snap on boxes on Craigslist. I always go to the Cummins tool sales when they stop by. I always buy a $20 set of wrenches that go from 3/8" to 1 1/4". They get cut up, heated and bent, etc. I always buy a punch set from them, a hammer set, and whatever else does not need to be Snapon, but usually more disposible. avoid the craftsman base 3/8 and 1/4 drive rachets, the ones that came in the sets, they are crap. the upgrade rachets are pretty good. Ive got a mix, about half snap on, the out of the truck financing is part of why the tools are so high. 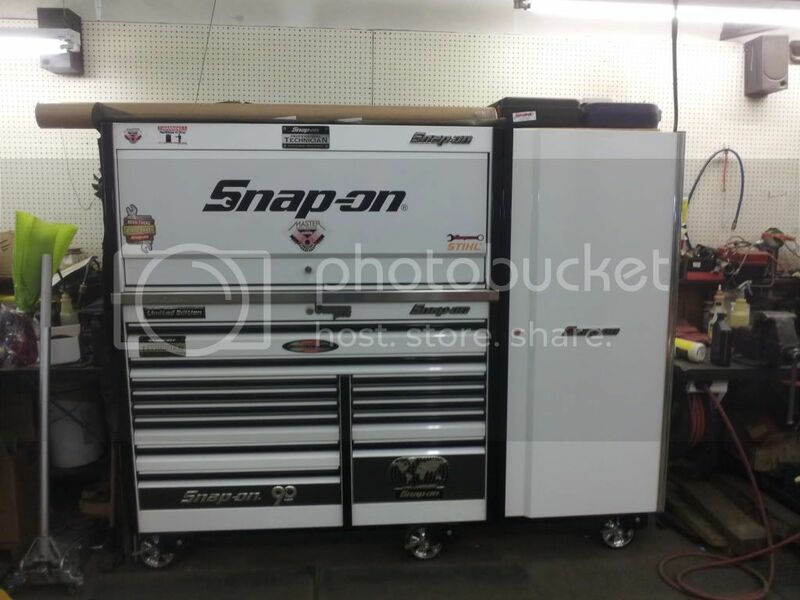 snap on stuff that isn't hand tools are all built by someone else and you can get a better deal elsewhere, things like hydraulic jacks, jack stands, welders and such. Most of snap ons hand tools are built by williams, you have a hard time finding williams tools for sale. I really like my craftsman 19.2 volt power tools, especially with the lithium batterys, the dewalt and milwaukee cordless stuff the batteries are way high priced and the way the battery clips into the tool is more prone to breakage than the craftsman. I would recommend snapon, craftsman, mac,matco, and some proto. Snapon makes good stuff but as people have said, it is guna take some money. I usually pick up most of my snapon from pawn shops. I have used craftsman forever and havent had a problem except their ratchets and a few other things. I like the new snapon 80 tooth ratchets because they work in tight spaces and are very durable. As for bigger wrenches ive never gone wrong with just china wrenches. The way i look at it is if theyre the right size and are a chunk of steel they will usually work. As for cordless tools, i have a snapon half inch drive impact that is awesome. Craftsman also makes good cordless and i like makitas drill and impact driver. I am slowly building my set up. I get discounts through work for Grainger and McMaster-Carr. Honestly, I like the Stanley sets at Walmart. I have put a 3ft cheater pipe on one to break my lug nuts loose (someone used an impact on aluminum wheels...). I busted a Craftsman 1/2" drive that was used on the same lug nuts. Got about 3 of them off when it went. That was purchased and then replaced at the local Ace Hardware. I busted a Stanley 1/2" years ago. Trying to break the wheel chock bolts loose on an old 1947 Farmall H that looked like the tires were never replaced. 1-1/8" bolts were no match for the Stanley and 6ft of pipe. I jammed it up. Took it to Walmart, and got it replaced no questions asked. I also got a 19.2v Li-On 1/2" Craftsman impact. Love that thing. I don't know how I got 1/2 my crap loose correctly without it. Tools are tools. Craftsman aren't s good as they used to be and harbor frieght are cheap and have a lifetime warranty as well but they all will get the job done one way or another. if you use tools every day or need them to last i prefer snap on. the man is at my shop every week and warranty is never an issue. Ive had matco and they are ok but my snap on tools have held up longer over the years. It all depends on how much you want to spend. I use my tools everyday. I have a Snap on box and all my tools are organized very well so i can be efficient in my job. Tools are an investment no matter what you have! That's a frickin' sweet box! My box at home looks like your 1st one. I can do almost as much at home as I can at work with the service truck. I have a 75th Anniversary Edition Snap On box at work. When I get my truck out of the garage it's coming home, I just don't need it there. I'll take in my old Crapsman bottom and put the Mac top on it. I only use it for storage of odd stuff anyways. I'll have to rearrange my bench and the whole back wall of the garage, but I can make it fit!